Today, we have a guest post from Michelle Czolba of Wildly Natural Skin Care Oils. 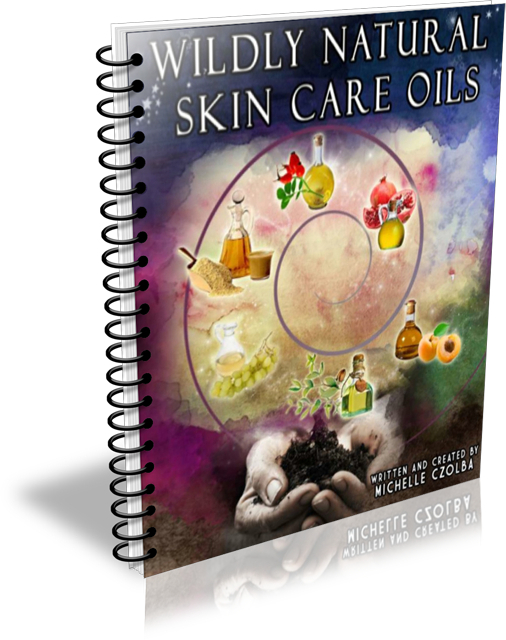 Michelle’s ecourse, Wildly Natural Skin Care Oils, is part of the Extreme Health Library bundle that is available through March 7th. The bundle contains 53 eBooks, video sets or resources for $39.97. Some of the top cooking oils are wonderful for the skin. Can you guess which ones? I cover two of them in this article, but take a guess just for fun. First let me go over all the aliases: skin oils are also known as carrier oils, natural skin care oils, plant oils, cold-pressed oils, seed oils and oils. They include famous and popular oils like olive, coconut, sunflower, rosehip seed oil, and so on and many are used for culinary and skin care uses. Natural skin care oils are so special for many reasons. For one, they hold much of the plant’s medicinal components, including fatty acids, pigments (antioxidants), vitamins and other fat soluble parts. Secondly, oils are the basis for many other skin products, including creams, lotions, salves, balms, and serums. Once you are familiar with the straight oil, your other creations will be that much more effective and unique. It is an emollient, which means it softens the skin and soothes roughness, dryness or abrasions. It keeps the skin smooth, supple and lubricated. It is protective, creating a barrier from moisture leaving the skin. The moisture comes from water that we drink and put on the surface through cleansing, floral waters and toners. Oils have many healing properties, including cell proliferation. They are good for a range of issues from cuts, cracks, rashes to skin conditions like acne, psoriasis and eczema. Many oils contain antibacterial properties, being excellent healers since they ward off infection while helping the skin to repair. Essential oils and natural skin care oils are totally different! Essential oils are a complex of chemicals within the plant extracted through distillation whereas natural skin care oils are the fats of the seeds or fruit of the plant. Essential oils are concentrated and used in very small amounts (diluted too) while skin care oils can be used liberally and on their own. It is a common myth that oils are only useful for those with dry skin. On the contrary, many people have success treating acne with a combination of oils. Those with oily skin often find that stripping the skin of its natural oils will cause more sebum production. Using a light plant oil will help to balance sebum production, whether dry, oily or somewhere in the middle. Choose the oils best suited for your skin type or condition. Apply oils to just washed or to moist skin. Massage in well. Be sure to use only a small amount of oil. This is a really important step, as the washing opens the pores and allows the oils to be absorbed rather than sitting on top of the skin. After a few minutes, you can gently dab off excess oil with a damp washcloth, particularly in areas where oil collects: nose, around eyes, chin. You could also rinse after applying the oil and then pat your skin dry. Use a small amount of oil, around ½ teaspoon and increase from there until you get the right amount for your skin. Depending on your skin type, the season, level of humidity and the type of oil you are using, this amount can change and vary! 1) Coconut Oil (Cocos nucifera) comes from cold pressing from the inner flesh of the coconut. It is a dry, light and slightly warm oil and is categorized as a Fire oil. I recommend using extra virgin, organic and unrefined coconut oil for best results. It has a soft, smooth texture and the deep, distinctive scent of coconuts. Coconut oil is 90% saturated fat with almost half of that as lauric acid. Lauric acid can kill some bacteria and is antifungal as well, making coconut oil a wonderful antiseptic for skin conditions. Practitioners of Ayurvedic medicine and traditional healers in India use coconut oil as a base for many medicinal preparations for treating skin diseases. It is a “dermal penetration enhancer” meaning that it easily permeates the skin. Coconut oil is a light oil with a slightly drying quality so it will not leave a greasy residue on the skin when applied properly. It is multifaceted: coconut oil can be used alone or blended with other natural skin care oils and essential oils, used in creams, salves and hair and lip balms. Coconut oil is used as a general body and face moisturizer, to assist with healing burn wounds, for atopic dermatitis, for rashes, warts and athlete’s foot, and for infant massage. 2) Olive Oil (Olea europaea) comes from grinding whole olives and pressing out the oil via mechanical or chemical means. It is a moist, heavy, and neutral oil and is categorized as a Water oil. Olive oil, particularly extra virgin, is very rich and heavy. Extra virgin olive oil is particularly suited to dry and mature skin to hold in moisture and nourish skin cells. It is also one of the most used oils used in the Oil Cleansing method. I have noticed that olive oil tends to sit on the surface of the skin and is slow to absorb for most skin types. That is why I generally recommend it either as an oil to be applied before the shower (an Ayurvedic technique) or to apply it to damp skin and then rinse the face once. This rinses the excess yet keeps the skin soft and holds in moisture. Greek and Mediterranean cultures depend heavily on extra virgin olive oil for face and skin. It is used as a skin softener and for dry, irritated or sunburned skin. It is also a skin luminizer, meaning that it makes the skin shine and glow! Extra virgin olive oil is an effective skin cell regenerator. This is the first pressing of the olive and contains the highest amount of nutrients. It attracts moisture while still allowing the skin to breathe. My baby oil blends often contain extra virgin olive oil, as it really nourishes and is so gentle. It is also great for the elderly and for dry, mature skin. Being that olive oil is so nutrient dense, it is a good addition to a facial oil blend. Depending upon your skin type, you can vary the amount of olive oil for your recipe. What oils did you guess in the beginning of the article? What other skin care oils do you use? Michelle Czolba, M.Sc. is the owner and writer at Wildly Natural Skin Care, where she shares her knowledge of truly natural skin care. After completing an herbal apprenticeship, she embarked on intensive self-directed and University study of various related skills including whole foods, natural skin care and cosmetics, plant identification, botany, permaculture, ecology, chemistry, metaphysics, and Earth-based spirituality. She also holds a Master of Science in Sustainable Systems and a Bachelor of Science in Environmental Science with a Minor in Chemistry.